Sample our products, tour our facility and learn about the birch sap harvest in Alaska’s forests. Come visit our Birch Syrup Taste, Tour, and Shop facility–just one mile from the Parks Highway at mile 99. We are always excited to have the opportunity to share our love of the birch forest and the bounty it provides. Learn about the joys and difficulties of a short and intense three-week harvest. Try all of our birch syrup and berry products along with select other Alaskan food products in our tasting room. Watch the full video of our harvest in the Alaskan bush and experience the rich history of our business and Alaskan lifestyle. Leave satiated, knowing what the evaporator does, and understanding why our “reserve” syrup is so different from our “late run” syrup. 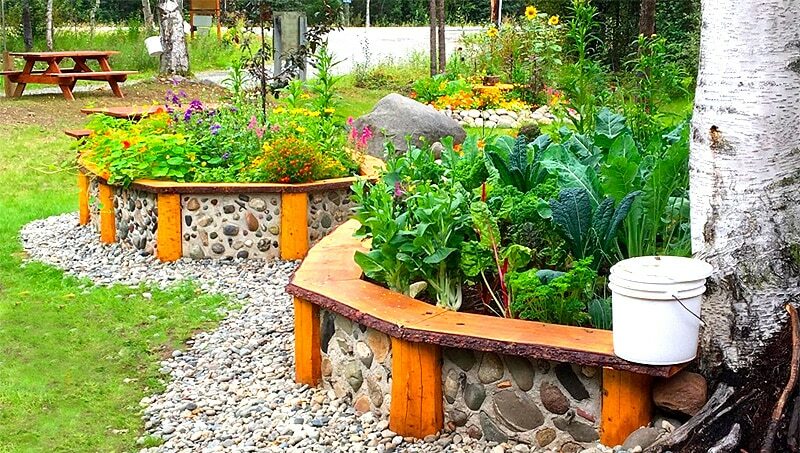 We are a true “goods from the woods” Alaska cottage industry that emphasizes the sustainable use of Alaska’s forest resources. Good stewardship and conservation of our forests is essential to the health of our people and the fragile ecosystems in which we hunt, fish, and gather. Come share our vision – we look forward to your visit! We proudly serve Alaska Supreme Ice Cream, made with local milk and cream. One of their flavors is, of course, birch! We offer several flavors with our syrups as toppings. Plan a picnic, or simply enjoy your ice cream, on our comfortable porch surrounded by our beautiful gardens. 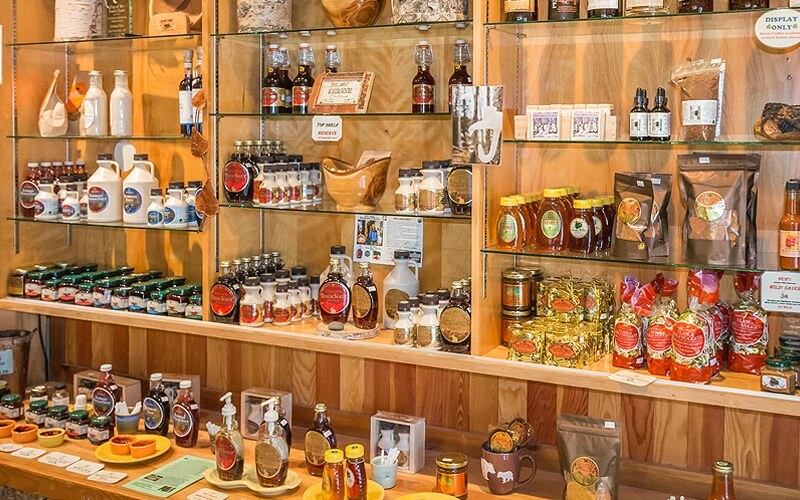 Our All Alaska gift shop focuses on Alaskan food products and functional, aesthetic art. We have local pottery, wood bowls, birch utensils, and tiles. We are also proud to offer locally produced botanical soaps and body care products. We carry a selection of Alaska related books–about cooking, foraging, and the outdoors as well as some of our favorite Alaska-themed children’s books. Like what you see but no room in your luggage? We can ship most items home for you in flat rate boxes. We also offer taste treats such as locally made ice cream with local flavors, including birch of course! Or try our snacks and baked goods, smoked salmon, locally roasted coffee or our own chaga tea. Taste our new birch water beverages that are wildly popular with our customers. Enjoy it all in our picnic area, surrounded by our bountiful vegetable and flower gardens. 38139 S. Talkeetna Spur Road, Talkeetna, Alaska. To find us: We are conveniently located on the Talkeetna Spur Road, only one mile from the Parks Highway (Alaska Hwy 3). There is plenty of parking and access for larger vehicles. It is easy to get in, and easy to get out. Buses, RV’s bicycles… everyone is welcome. Open mid-May to mid-September 10 am to 6 pm. We open post-harvest in May. Please call for dates if you are planning to visit then. Pulled off because we saw the sign and ended up shipping $160 of delicious items back home. Great little shop where the products are locally grown, harvested and made. We tasted lots of good items. They also have a short video that explains the process of collecting the birch sap and the process for making the syrup and other items. Nice little find along the side of the road into Talkeetna. I had never heard of birch syrup before, so on our way into Talkeetna, we decided to stop and check it out. We noticed the white buckets hanging from the trees on the way in. Interesting shop and lots of things to taste. With their offer of flat rate shipping, we purchased several local things to ship home, including the syrup. Well worth the stop. Thank you, Micheal and Josey, for a great presentation. Thanks for teaching about the difference between first and last run flavor. Your product is amazing. This is a MUST SEE if you’re in the area. Love all of the Alaskan products for sale. Very friendly welcome and plenty of birch products to sample. You can go into the back room where the magic happens and watch a short video on how they get the syrup and what they do with it. Nice to see that it’s still a small family run business. After the video you can do a taste tour of the syrup from the beginning of the season to the end. It was amazing how much the flavor changes. They were nice enough to hold our purchases for a week before shipping them to our house so they wouldn’t beat us home. Nice Gardens and Good Ice Cream! I’ve been driving past this place for years and never knew that they had fresh made ice cream in unique flavors, including their own birch syrup flavor! You’ve got to try it if you have any sense of adventure. They also have all sorts of birch syrup samplers in addition to other Alaskan souvenirs. The garden and bench area outside is cool and shaded and a nice place to hang out while you eat your ice cream. It’s definitely worth a stop for some ice cream on a hot summer day if you’re headed to or from Talkeetna.